If you're looking for a hearty cookie that travels well, look no farther. This recipe for Honey Oatmeal Cookies may be just exactly what you want. Packed with the natural sweetener, honey, and raisins and chopped nuts, this is the perfect snack companion for a hike, a long car trip, sending throught the mail in cookie care-package, or perfect as an at home after-school snack. You can use your favorite nut when making these cookies. We like them with walnuts, but could also imagine how good they would taste with almonds, pecans or peanuts. These cookies will turn out moist, so be sure to keep them stored in a tightly covered Cookie Jar . In a mixing large bowl beat sugar, shortening, eggs and honey until well combined. Stir in flour, baking soda, salt, quick-cook oats, raisins and nuts until well mixed. Drop dough by rounded teaspoonfuls about 2 inches apart onto ungreased cookie sheet. Bake about 8 to 10 minutes, until lightly browned. 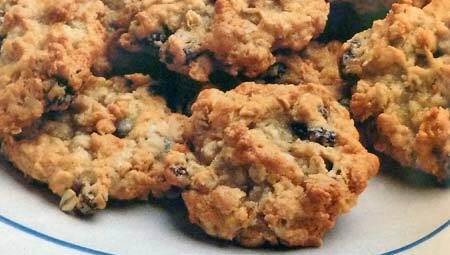 This recipe yields about 5 dozen Honey Oatmeal Cookies.